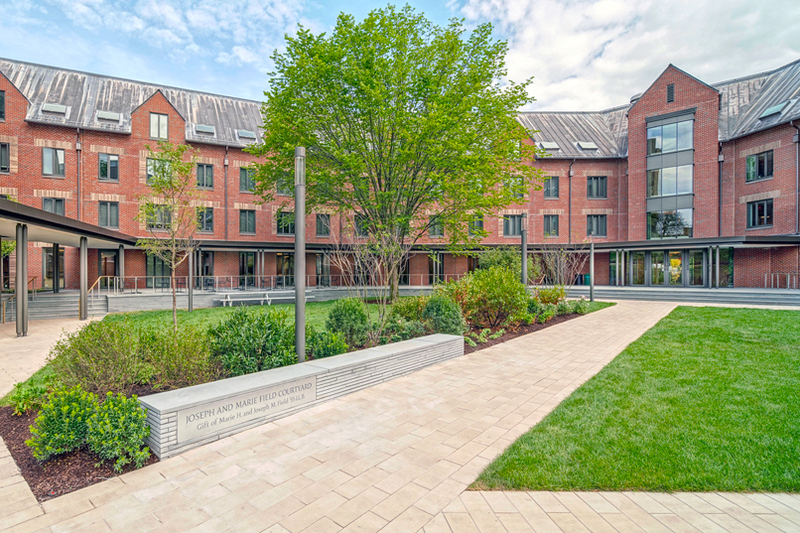 A view of the newly renovated courtyard at Baker Hall. A jubilant crowd gathered at the newly opened Robert C. and Christina Baker Hall on September 20, 2018, for a celebratory ribbon-cutting ceremony and dedication. The occasion marks the first time Yale Law School has expanded its physical footprint since 1931 when the Sterling Law Building opened. Located just a block across the street from Sterling, Baker Hall will serve as an academic, social, and residential hub for the Law School, creating a more dynamic and immersive educational experience for the community. The building adds 137,000 square feet to the Law School’s campus — including residential suites, a three-tiered student center, a two-tier lecture theater, and rooms for seminars, small groups, and the School’s innovative interdisciplinary centers and programs. The new space returns residential life back to the Law School’s campus for the first time in many years, featuring modern, apartment-style living options for Yale Law School students. Five years ago, the proposed expansion of Yale Law School gained momentum when Robert Baker ’56 B.A., ’59 L.L.B and his wife, Christina, made an extraordinary leadership gift of $25 million. This inspired many other donors, launching a campaign that raised more than $60 million and led to the transformative renovation that came to life this year. The building was previously used as a swing space by Yale University until being sold to Yale Law School for the purpose of the renovation. “All of us at the Law School owe a debt of gratitude to my predecessors as dean, Robert C. Post ’77 and Harold Hongju Koh, for their vision and steadfast leadership during this project; to Robert and Christina Baker and so many other donors for their incredible support; and to the planners, architects, and builders for their dedication to innovative excellence,” said Gerken. Baker Hall consists of four floors, a basement, and a courtyard. The first floor received the most extensive renovation, adding much needed additional classroom space, including the Paul Tsai lecture theater as well as break-out spaces that will make Baker Hall ideal for conferences. The second, third, and a portion of the first floors are residential with 111 beds in a variety of apartment styles, each equipped with a kitchenette, shared living space, private bedrooms, and a bathroom. The residential floors offer lounges for both quiet study and socializing. The fourth floor includes programmatic space and houses a portion of the Law School’s interdisciplinary centers as well as three seminar classrooms and two student study workspaces. One of the key goals with the renovation was to create a forum for both formal and informal student gatherings through the expansive new student center, social and study gathering spaces, and the new outdoor Joseph and Marie Field Courtyard. President Salovey also remarked about the significance of returning residential life to the law school. “We are grateful to the alumni and friends who supported this essential project, and especially to Robert Baker, whose early example and founding gift made possible this vital, welcoming space that in coming years will sustain learning in the fullest sense,” said Post. Speaking at the event, Robert Baker recalled first seeing what was once called the “swing space” and hearing about the proposal for what Baker Hall could be with the right funding and vision. “I considered this a unique opportunity to truly give back,” recalled Baker, who said he attributed much of his financial success to his Yale Law School education. Baker also thought about the deep history his family had with Yale Law School. His brother, Gerald Baker ’67, also graduated from Yale Law School, as did his son Nelson Baker ’88 and his daughter Ashley Baker ’07. Robert Baker is the founder and chairman and CEO of National Realty & Development Corp., one of the country’s largest private development and ownership firms. With a career in private development and real estate spanning half a century, Baker is an expert in property acquisitions, financing, management, and construction. The building was designed by Pirie Associates Architects of New Haven and constructed by A/Z Corporation, based in Stonington, Connecticut. Laura Pirie, Principle of Pirie Architects, said when re-imagining Baker Hall, her firm sought to reincorporate the combination of academic, social, and residential spaces that so many Yale Law School alumni fondly remember about their time at Yale Law School. The design focused on increasing the visual and physical access to the outdoors and the daylight, adding floor-to-ceiling windows in many areas of the building. The holistic design approach also worked to incorporate art into the building that includes paintings, photographs and sculptures referencing diversity, social justice, and the community impact of the Yale Law School graduates’ work in the world at large. For more information, visit law.yale.edu/BakerHall. Facts about the project are available here. Media interested in photos can email debra.kroszner@yale.edu.